With Florida’s rainy season just around the corner, it’s best to get your home prepared for the effects of Mother Nature. About 70% of Florida’s rainfall happens between May-October and many times all that water results in floods. Sadly, floods can cause irreparable damage to homes and ruin precious belongings. Make sure you get your home family ready for the upcoming wet season. When afternoon rains become a daily norm and the ground can no longer soak up all the water, it is important to have other ways for it to drain away. Be sure to clear debris away from grates, swales and ditches around your home. Standing water is normal, especially if there have been heavy amounts of rain. 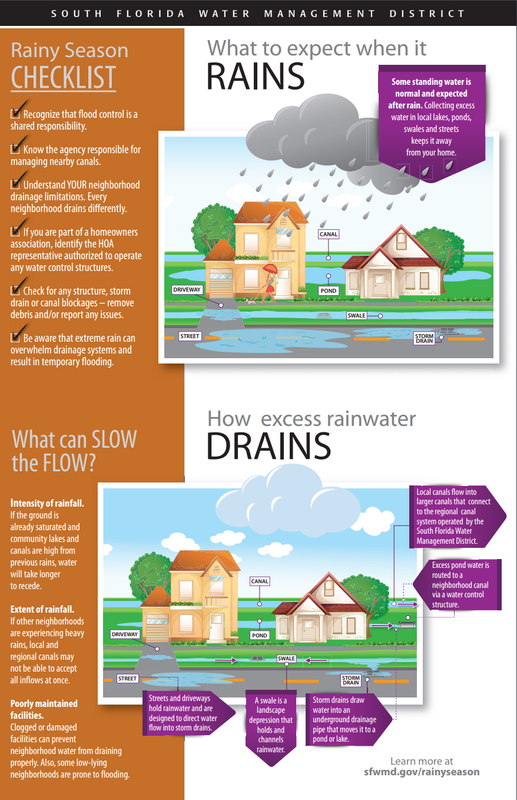 For local flooding concerns, report problems to your homeowners association, local drainage district or county. Keep a watertight container full of important paperwork like insurance papers, receipts for major purchases and video or written inventory of the belongings in your house. This will be helpful when it comes time to contacting your insurance company. Secure all valuables like jewelry, artwork and precious family heirlooms from getting lost or ruined in the event of a flood. Getting prepared ahead of time can save heartache in a quick-moving flood situation. It will be much easier knowing that your items are protected. If a major flood is on its way, you can also elevate major appliances like washers and dryers to minimize damage. Living in Florida, it is quite common to have an emergency kit during storm season. Some important things to have, but not limited to: flashlights, bottled water, radio, non-perishable and canned food items, first-aid kit, blankets, games (for entertainment). And don’t forget about your furry four-legged family members. Be sure to have a plan in place for them as well. If you need to leave your home and go to a shelter, make sure that you choose one that is pet-friendly. They could also use an emergency kit filled with bottled water, food, toys, leashes, and a blanket.